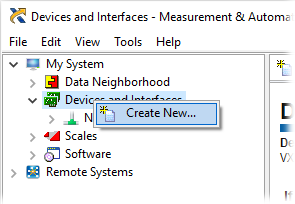 Right-click Devices and Interfaces and select Create New. A dialog box prompts you to select a device to add. Select Simulated NI-DAQmx Device or Modular Instrument and click Finish. In the Choose Device dialog box, expand CompactDAQ Chassis and select the chassis you want to simulate. Select the device and click OK. In the configuration tree in MAX, the icons for NI-DAQmx simulated devices are yellow. Right-click your CompactDAQ chassis and select Configure Simulated cDAQ Chassis to add C Series devices. To remove an NI-DAQmx simulated device, right-click the device and click Delete.